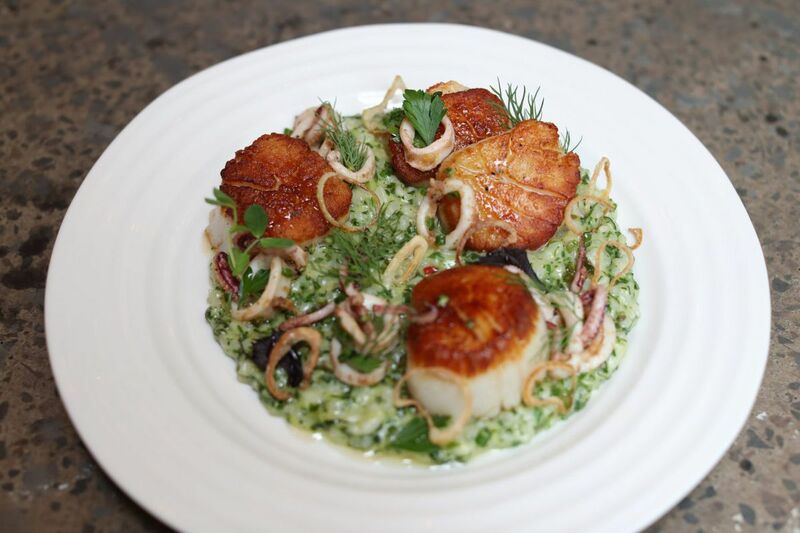 The scallop and calamari with risotto at Talula's Garden. There are great restaurants, and then there are impactful ones. And few arrivals in the last several years have improved the quality of life for an entire neighborhood of diners as much as the Talula's compound on Washington Square. I'm talking, of course, about Talula's Garden and its more casual next-door market, Talula's Daily. Between the two, the sidewalk-cafe tables and the light-strung patio garden exude organic happy vibes onto the square from morning to night. (Except, of course, for some disgruntled, underpaid employees — and more on that later). If you've had one of pastry chef Vita Shanley's fluffy scones at 7 a.m., or a buttery grilled cheese and ham at noon, or one of the oozier cheese boards from the roster of 40 ripe beauties at dinner, you'll know what I mean. But with nearly 350 people a night during prime weather devouring the à la carte menu at the Garden, the decidedly bustling and urban vibe there will never feel as intimate as its prix-fixe country cousin. Its success, though, has been learning to translate some essentials of the Table's spirit: the cultivated farm chic aesthetic, a crew of earnestly engaged servers who reflect co-owner Aimee Olexy's wonky cheese goddess persona, and a smart menu driven by seasonality and prime ingredients. After some early turnover, the Garden's kitchen has hit its stride under current chef Charles Parker. A recent meal presented to a national conference of 100-plus food writers from around the country was impressively on point considering the volume of diners served, with juicy, spice-rubbed Green Circle chickens and sweet corn, a bountiful salad showcase for Olexy's coveted Pennsylvania cheeses, and a smart carrot cake revamp with carrot sorbet. The Garden remains a reliable destination for a special occasion or big event. But it was really the addition of the cafe-market three years ago that helped the Talula's universe finally sync to the rhythm of its neighbors' lives, from the breakfast regulars at the community table digging into steel-cut oats and deep-dish frittatas, to the lunch crowd of glam moms (with tots) and docs in lab coats grabbing bountiful salads, to those who've discovered the Daily's monthly prix-fixe suppers (five courses for $55) to be a genuine bargain. For December's supper? Crispy clams with celeriac-apple slaw, duck à l'orange and pecan tastes. Not all has been so cheerful, though, at the Talula's compound of late. The Garden's warm-and-fuzzy image suffered a black eye in October when it was hit with a major federal fine for shorting workers' wages. Nearly $400,000 in back pay and penalties later, "lessons have been learned," Olexy says. Policies have changed to assure there is no "gray area" and that workers are clocked-in from the moment they enter the building. Did Talula's get slammed for a careless practice that many other notable restaurants would also be guilty of if scrutinized? Absolutely. Am I OK with that? Definitely not. But Starr and Olexy have paid their penalty and made corrections. It's also notable that few restaurants in town can match Talula's in terms of staff longevity. So life goes on at what remains, by most measures, one of Philly's best places to eat, and an essential cornerstone on Washington Square. Shanley even has a following that shows up for the "pick-me-up" of cookies that emerge from her oven warm and buttery at 2 p.m. daily. Now that's quality of life improved.